The Church of the Incarnation is located at 35th and Madison Avenue in Manhattan. The stained glass windows are spectacular, produced by leading artists of the late 1800’s: American artists Louis Comfort Tiffany and John LaFarge and British artists William Morris, Henry Holiday, Clayton and Bell, Heaton, Butler & Bayne, and C.E. Kempe. “Art scholars and historians agree that this collection represents one of the finest existing examples of glassmaking during one of the craft’s richest and most prolific periods," according to the Incarnation website. 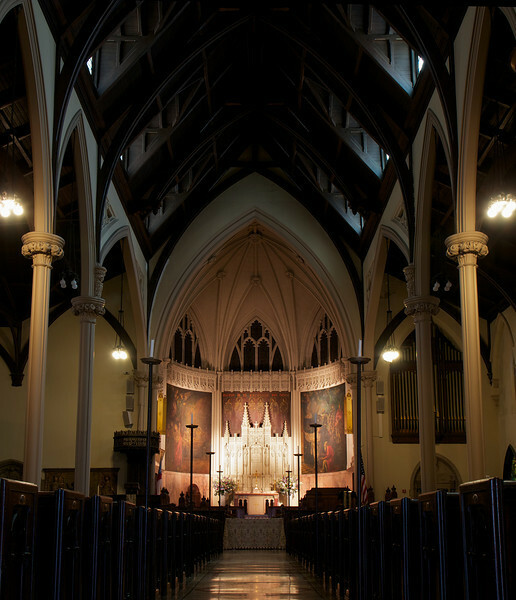 The church was founded in 1850 as a mission chapel of Grace Church at 28th and Madison Avenue, providing free or low cost pew rentals. From the Incarnation website, during the 19th century, it was customary for Episcopal churches in New York to meet their expenses with a system of pew rentals, rather than through what has now become traditional weekly tithes. Certain pews were kept open for visitors and those who could not afford a pew, but some churches went a step further and built mission chapels where pews were either free or rented for very small amounts. In 1852, it became an independent church under the name of The Church of the Incarnation. Land for the current church was purchased in 1863. Emlen T. Littell designed the building, which was consecrated in 1854. Littell described the architecture as “Early Decorated Church Gothic,” according to the Incarnation website. “Frequently referred to as “Neo-Gothic,” the architecture of the church is historically based on the so-called English 19th century Commissioners’ style, named for the Commission of the Church Building Society. This group built modest, attractive churches for the many new communities in England created during the industrial revolution. The churches feature a narthex, an open nave with side aisles, and a short chancel; Gothic Revival style added steeply pitched roofs, towers and a clerestory." The church was severely damaged by fire in 1882, which left standing the western wall and tower. David Jardine was commissioned to oversee the rebuilding. Guided by Littell’s original design, the building reopened for services in 1882. All of the current windows were completed and installed within a decade after the fire. The windows depict the religious narrative of events from Christ’s life in the New Testament, and with key figures and events from the Old Testament. Admiral David Farragut (“Damn the torpedos! Full speed ahead!”), Eleanor Roosevelt (who was confirmed there) were parishioners. The funeral of Franklin Delano Roosevelt's mother was held at the church. The website mentions that many members of the Delano and Morgan families were members of the church. The church fell on hard times before 1950 and the church rector recommended that it be closed and the property sold. However, the church survived. With the arrival of the current rector, cost-cutting measures and concerted efforts at fundraising were made, and Incarnation is currently enjoying a surge in membership according to the church website.